Valandraud's first vintage from Jean-Luc Thunevin and Muriel Andraud, the eponymous co-owner, was 1991. Managed yields, attentive viticulture, rigorous selections, mature fruit, made Valandraud a model which others would emulate. As a result the wines were often richer, more powerful than many wines of the period. If the concept was avant-garde so were its aspirations. Valandraud's pricing strategy was also a model for others to follow. Valandraud was never cheap: not to make nor to buy. Earlier vintages were more globally widespread in their availability at auction but it seems that post-1998 the auction market has favoured selling these wines in the US. A lack of strong interest from the Far East has meant that the wines don't have the under-pinning that other Bordeaux wines have seen whilst the economic crisis has knocked confidence, not least in garage wines, which have lost some of their sparkle in connoisseurs' eyes. However, some lots of the 1998 – 'Very fine and elegant... ' - (1,000 cases 96 points, $85 release, $189 current Note 1all prices are converted to a standard bottle format of 75cl did achieve a good price in New York recently ($2,272 case of 12, 75cl). But this vintage is well off its highs (2010: $227/75cl). 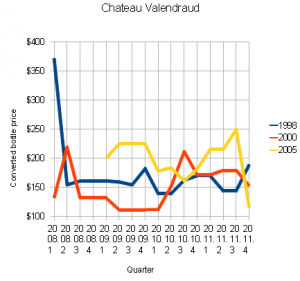 Valandraud 2000 - '...the epitomy of balance and complexity' – (1,500 cases, 95 points, $120 release, $153 current) shows some gains on its values from 2009 but 2010 was its strongest year so far. The prices are driven by US enthusiasm, but are volatile. 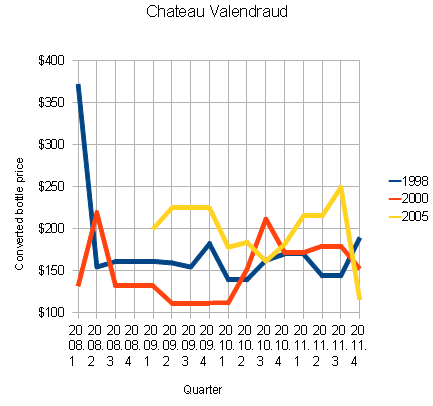 Valandraud 2005 - 'Full of body and yet very elegant' – (1,500 cases, 90-95 points, $225 release, $116 current) is bumping along the bottom. But there have been some highlights, a case of 75cl bottles selling at Zachys in NY for $2,900 in February (and again in September in HK). It's worth noting that a fairly sizeable proportion of lots coming onto the market are large formats (30%) and prices do fluctuate quite widely. The cadence of prices as one goes through the years is correctly reflected by their maturity. Each vintage of Valandraud is quite distinct in its character. The 1998, for example, having a much larger proportion of Cabernet Franc in the blend (50%). The 2000 and 2005 were up to 70% Merlot. They are all wonderful wines which should continue to appreciate driven by their scarcity, quality and ability to age. You may be able to pick up a bargain, especially while the market is down. Their rarity, however, may mean they will never be a consistent performer. Content derestricted Feb 11, 2015 ...you need to upgrade your subscription if you wish to read this content when it appears.